A digital audio workstation (DAW) is an electronic device or application software used for recording, editing and producing audio files. DAWs come in a wide variety of configurations from a single software program on a laptop, to an integrated stand-alone unit, all the way to a highly complex configuration of numerous components controlled by a central computer. Regardless of configuration, modern DAWs have a central interface that allows the user to alter and mix multiple recordings and tracks into a final produced piece. DAWs are used for the production and recording of music, songs, speech, radio, television, soundtracks, podcasts, sound effects and nearly any other situation where complex recorded audio is needed. Early attempts at digital audio workstations in the 1970s and 1980s faced limitations such as the high price of storage, and the vastly slower processing and disk speeds of the time. In 1978, Soundstream (who had made one of the first commercially available digital audio tape recorders in 1977) built what could be considered the first digital audio workstation using some of the most current computer hardware of the time. The Digital Editing System, as Soundstream called it, consisted of a DEC PDP-11/60 minicomputer running a custom software package called DAP (Digital Audio Processor), a Braegen 14"-platter hard disk drive, a storage oscilloscope to display audio waveforms for editing, and a video display terminal for controlling the system. Interface cards that plugged into the PDP-11's Unibus slots (the Digital Audio Interface, or DAI) provided analog and digital audio input and output for interfacing to Soundstream's digital recorders and conventional analog tape recorders. The DAP software could perform edits to the audio recorded on the system's hard disks and provide effects such as crossfades. By the late 1980s, a number of consumer level computers such as the MSX (Yamaha CX5M), Apple Macintosh, Atari ST and Commodore Amiga began to have enough power to handle digital audio editing. Engineers used Macromedia's Soundedit, with Microdeal's Replay Professional and Digidesign's "Sound Tools" and "Sound Designer" to edit audio samples for sampling keyboards like the E-mu Emulator II and the Akai S900. Soon, people began to use them for simple two-track audio editing and CD mastering. In 1989, Sonic Solutions released the first professional (48 kHz at 24 bit) disk-based nonlinear audio editing system. The Mac IIfx-based Sonic System, based on research done earlier at George Lucas’ Sprocket Systems, featured complete CD premastering, with integrated control of Sony’s industry standard U-matic tape-based digital audio editor. This combination of audio software and hardware was the earliest commercial example of what is now referred to as a Digital Audio Workstation or DAW. In 1994, a company in California named OSC produced a 4-track editing-recorder application called DECK that ran on Digidesign's hardware system, which was used in the production of The Residents' "Freakshow" [LP]. Many major recording studios finally "went digital" after Digidesign introduced its Pro Tools software, modeled after the traditional method and signal flow in most analog recording devices. At this time, most DAWs were Apple Mac based (e.g., Pro Tools, Studer Dyaxis, Sonic Solutions). Around 1992, the first Windows based DAWs started to emerge from companies such as IQS Innovative Quality Software (now SAWStudio), Soundscape Digital Technology, SADiE, Echo Digital Audio, and Spectral Synthesis. All the systems at this point used dedicated hardware for their audio processing. In 1993, the German company Steinberg released Cubase Audio on Atari Falcon 030. This version brought DSP built-in effects with 8-track audio recording & playback using only native hardware. The first Windows based software-only product, introduced in 1993, was Samplitude (which already existed in 1992 as an audio editor for the Commodore Amiga). In 1996, Steinberg introduced Cubase VST, which could record and play back up to 32 tracks of digital audio on an Apple Macintosh without need of any external DSP hardware. Cubase not only modelled a tape-like interface for recording and editing, but also modelled the entire mixing desk and effects rack common in analog studios. This revolutionised the DAW world, both in features and price tag, and was quickly imitated by most other contemporary DAW systems. An integrated DAW consists of a mixing console, control surface, audio converter, and data storage in one device. Integrated DAWs were more popular before commonly available personal computers became powerful enough to run DAW software. As computer power and speed increased and price decreased, the popularity of costly integrated systems with console automation dropped. Systems such as the Orban Audicy became standard production equipment at radio and television stations. DAW can simply refer to the software itself, but traditionally, a computer-based DAW has four basic components: a computer, either a sound card or audio interface, digital audio editor software, and at least one input device for adding or modifying data. This could be as simple as a mouse (if no external instruments are used) or as sophisticated as a piano-style MIDI controller keyboard or automated fader board for mixing track volumes. The computer acts as a host for the sound card/audio interface, while the software provides the interface and functionality for audio editing. The sound card/external audio interface typically converts analog audio signals into digital form, and digital back to analog audio when playing it back; it may also assist in further processing of the audio. The software controls all related hardware components and provides a user interface to allow for recording, editing, and playback. Computer-based DAWs have extensive recording, editing, and playback capabilities (some even have video-related features). For example, musically, they can provide a near-infinite increase in additional tracks to record on, polyphony, and virtual synthesizers or sample-based instruments to use for recording music. A DAW with a sampled string section emulator can be used to add string accompaniment "pads" to a pop song. DAWs can also provide a wide variety of effects, such as reverb, to enhance or change the sounds themselves. Simple smartphone-based DAWs, called Mobile Audio Workstation (MAWs), are used (for example) by journalists for recording and editing on location. Many are sold on app stores such as the iOS App Store or Google Play. As software systems, DAWs are designed with many user interfaces, but generally they are based on a multitrack tape recorder metaphor, making it easier for recording engineers and musicians already familiar with using tape recorders to become familiar with the new systems. Therefore, computer-based DAWs tend to have a standard layout that includes transport controls (play, rewind, record, etc. ), track controls and a mixer, and a waveform display. Single-track DAWs display only one (mono or stereo form) track at a time. 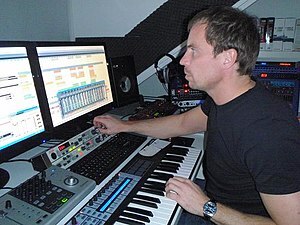 The term "track" is still used with DAWs, even though there is no physical track as there was in the era of tape-based recording. Multitrack DAWs support operations on multiple tracks at once. Like a mixing console, each track typically has controls that allow the user to adjust the overall volume, equalization and stereo balance (pan) of the sound on each track. In a traditional recording studio additional rackmount processing gear is physically plugged into the audio signal path to add reverb, compression, etc. However, a DAW can also route in software or use audio plug-ins (for example, a VST plugin) to process the sound on a track. DAWs are capable of many of the same functions as a traditional tape-based studio setup, and in recent years have almost completely replaced them. Modern advanced recording studios may have multiple types of DAWs in them and it is not uncommon for a sound engineer and/or musician to travel with a portable laptop-based DAW, although interoperability between different DAWs is poor. Perhaps the most significant feature available from a DAW that is not available in analog recording is the ability to 'undo' a previous action, using a command similar to that of the "undo" button in word processing software. Undo makes it much easier to avoid accidentally permanently erasing or recording over a previous recording. If a mistake or unwanted change is made, the undo command is used to conveniently revert the changed data to a previous state. Cut, Copy, Paste, and Undo are familiar and common computer commands and they are usually available in DAWs in some form. More common functions include the modifications of several factors concerning a sound. These include wave shape, pitch, tempo, and filtering. Commonly DAWs feature some form of automation, often performed through "envelopes". Envelopes are procedural line segment-based or curve-based interactive graphs. The lines and curves of the automation graph are joined by or comprise adjustable points. By creating and adjusting multiple points along a waveform or control events, the user can specify parameters of the output over time (e.g., volume or pan). Automation data may also be directly derived from human gestures recorded by a control surface or controller. MIDI is a common data protocol used for transferring such gestures to the DAW. MIDI recording, editing, and playback is increasingly incorporated into modern DAWs of all types, as is synchronization with other audio and/or video tools. There are countless software plugins for DAW software, each one coming with its own unique functionality, thus expanding the overall variety of sounds and manipulations that are possible. Some of the functions of these plugins include digital effects units which can modify a signal with distortion, resonators, equalizers, synthesizers, compressors, chorus, virtual amp, limiter, phaser, and flangers. Each have their own form of manipulating the soundwaves, tone, pitch, and speed of a simple sound and transform it into something different. To achieve an even more distinctive sound, multiple plugins can be used in layers, and further automated to manipulate the original sounds and mold it into a completely new sample. There are many free and open-source software programs that can facilitate a DAW. These are often designed to run on a variety of operating systems and are usually developed non-commercially. The development of digital audio for Linux and BSD fostered technologies such as ALSA, which drives audio hardware, and JACK. JACK allows any JACK-aware audio software to connect to any other audio software running on the system, such as connecting an ALSA- or OSS-driven soundcard to a mixing and editing front-end, like Ardour or Rosegarden. In this way, JACK acts as a virtual audio patch bay, and it can be configured to use a computer's resources in real time, with dedicated memory, and with various options that minimize the DAW's latency. This kind of abstraction and configuration allows DJs to use multiple programs for editing and synthesizing audio streams, or multitasking and duplexing, without the need for analogue conversion, or asynchronous saving and reloading files, and ensures a high level of audio fidelity. Audacity is a free and open-source digital audio editor that can run on Microsoft Windows, but also on OS X, Linux, and other Unix-like systems (including OpenSolaris and TrueOS); it is particularly popular in the podcast community, and also has a large following among the visually impaired due to its keyboard interface. However, it lacks MIDI support, concentrating more on sound manipulation and management than discrete events and sequencing. Rosegarden is a multi-featured audio application that includes audio mixing plugins, a notation editor, and MIDI. The MusE Sequencer is a similarly featured audio application that includes an audio mixer and a MIDI sequencer. Other open-source programs include virtual synthesizers and MIDI controllers, such as those provided by FluidSynth and TiMidity. Both can load SoundFonts to expand the voices and instruments available for synthesis and expand the ports and channels available to synthesizers. Such virtualization allows users to expand the traditional limitations of ADC-DAC hardware. The Linux Audio Development (LAD) mailing list is a major driving force in developing standards, such as the LADSPA, DSSI and LV2 plugin architectures. The Virtual Studio Technology (VST) plugin standard is supported as an option by some such programs but is generally implemented as a separate plugin, not a built-in option, due to Steinberg's licensing scheme. Among others, the creators of Audacity provide an optional, somewhat minimalist, VST-to-LADSPA bridge plugin for their software, but it is a separate download. Multiple DAW developers also offer free versions of their commercial DAWs, with reduced functionality. Examples include Pro Tools First and Studio One Prime. Wikimedia Commons has media related to Digital audio workstations (DAW). ^ a b Kefauver, Alan P.; Patschke, David (2007-01-01). Fundamentals of Digital Audio, New Edition. A-R Editions, Inc. p. 133. ISBN 9780895796110. A list of software DAWs, Sequencers, Hosts, etc. List of DAWs for iOS platform.